Neo-Nazi shitehawks National Action had declared that August the 15th 2015 would be “the day your grandchildren remember as Nation Action made history”. The reality was that hundreds of militant antifa controlled the streets the whole day, surrounded Lime St. Station, and showed the racist scum the true meaning of ¡No pasarán! 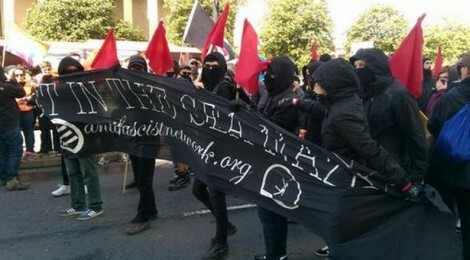 While the morning started with Unite Against Fascism (UAF) putting on their usual talking heads before marching away from the fascists, the Anti-Fascist Network (AFN) held it’s own march to take the streets long before the neo-Nazis would arrive. The AFN bloc first left the fascists hemmed into Line Street Station before they were able to get past the police and into the station itself. The leadership of National Action were forced to lock themselves into the lost property office! By 1:20pm the police had managed to muster enough numbers to get the fascists out, but the march itself was called of off. Despite the claims of politicians and the unions, the real victory against the neo-nazis was won by those who took direct action in Liverpool!